So, I’m not sure whether I mentioned how I got into The Kingskiller Chronicles by Patrick Rothfuss. I discovered The Name of The Wind on my father’s kitchen table in Wales. My brother had seen it somewhere and, without having heard of it before, bought it on the strength of the blurb alone. That is a good way to buy a book. Unfortunately, since my brother had bought it, I wasn’t able to steal it from him there and then but had to wait until he’d finished it, by which time my father had nabbed it to read. All in all it took me until January to steal it and read it. By the end of it I was hooked. I wanted to know what happened next. I called my brother to see if he had the next in the series. He told me he didn’t, it wasn’t out for ages. I took to google. Turns out my brother isn’t familiar with googling pub dates because it was already out. 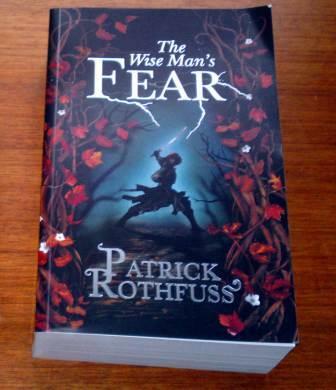 I quickly ordered two copies of The Wise Man’s Fear one for myself, one for him and my Dad in Wales. I finally got around to reading it on Saturday, I finished it last night. Which, when you consider I had a busy weekend travelling to Wales for a wedding, back to Oxford, work and a hospital appointment is no mean feat. But you see, the book is compelling. It continues Kvothe’s life story, as narrated by Kvothe to the Chronicler (keep up, I’ve told you about this before!) and contains some of the tantalising events (such as his “meeting”with Felurian) which occur in the lead up to him becoming the Innkeeper of the Waystone Inn-which might sound like an uninspiring journey, but he’s hiding out, pretending to be dead having caused an awful lot of trouble in his time. Like The Name of The Wind, The Wise Man’s Fear is brilliantly written, hilarious and dramatic by turns. Something I especially like is that we get to see a bit more of Bast, Kvothe’s apprentice, who is by turns devoted or demented, sometimes both at once. 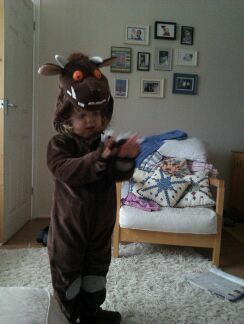 100% Fae. I can’t wait to read the next one and see a bit more of his meetings with the Faen. I also want to know if some of the theories I’ve been developing are accurate. I can’t even bounce them off my brother until he’s finished the book. They’re not spoilers (in for the first two books at least) but he doesn’t believe me. I’ll give you a hint at one though. I think Kvothe’s mother’s over reaction to him singing the Lackless song in NOTW (she’s a real person you know!!! ), his father calling her Tally and Meluan’s hatred of the Ruh might just be connected. Now to the stone door. Who could be a son of the blood? Hmmm? If you know anything about the publication date for The Doors of Stone please tell me. Pleeeeeeassse. I’m begging. For accurate information I’m willing to forgive his use of the word minge as an alternative to whinge. It means something quite different in the UK…. This entry was posted in Book Reviews and tagged books on February 29, 2012 by Siobhan. Having never read any of Clare Morrall’s writing, I have to admit to my initial attraction to this book being more a result of the copper embellished cover than the author’s name. In future though her name alone will be enough. Quinn is a homeless man who lives in a caravan parked in the middle of a motorway roundabout and lives by scavenging left over food from a nearby service station. Though this probably wouldn’t be most people’s ideal existence, this is the best way he knows of escaping from the isolating legacy of being semi-fictionalised with his three sisters, the triplets, in his mother’s books for children. Quinn is approaching happy with this way of life, until a pushy journalist comes along asking questions. 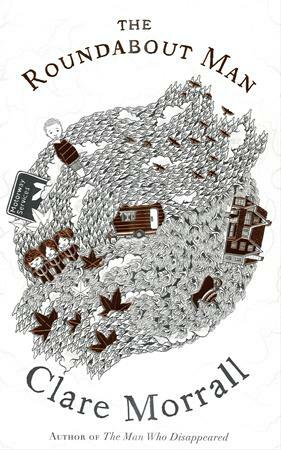 The Roundabout Man is a really clever fusion of urban legend, news story and popular history. I’m sure everyone has heard stories suggesting that a local tramp is a secret millionaire or about Enid Blyton’s distance from her own daughters. Many of us will have watched Finding Neverland and heard of the mixed emotions of the Llywelyn-Davies boys at the notoriety that inspiring the play achieved. Even a news story from a few years ago about a farmer who built a castle without planning permission and hid it behind straw bales gets included. Morrall fuses these varied influences fluidly to create an interesting and unique fiction which doesn’t feel forced. For me, the examination of Quinn’s relationship with his mother was the most interesting aspect of this book. Stories about good mothers are ten a penny and there are plenty of stories about bad mothers out there as well, but I often find these lapse into evil stepmother stereotype or worse into child abuse memoir type stories. I don’t know about you but neither of these appeals to me very much. This relationship is shadowy, but has a certain credibility, despite being a work of fiction. An unusual and enjoyable read, I will hunt down her other book soon. This entry was posted in Book Reviews and tagged books on February 28, 2012 by Siobhan. I saw this gorgeous post on flying by the seat. I love them all, but I think for sheer snuggle up and read value, Shakespeare and Co. Paris has to be my favourite. This entry was posted in Uncategorized on February 9, 2012 by Siobhan. If you want to know more about the inimitable Mr Dickens on his 200th birthday, look no further than this brilliantly written biography by Claire Tomalin. Following his journey from boot blacker to famous author, Tomalin examines the popular public face of Dickens and his shadowy private life. Examining each facet of Dickens’ life, Tomalin explores the dichotomies in Dickens’ character which saw a on one hand a charitable man who devoted much of his life to campaigning for the rights of the poor, opening a home for fallen women, supporting the right of divorced women to retain custody of their young and involving himself in every manner of charitable endeavour but on the other, a man who coldly cut off his siblings and children when they displeased him. Not to mention his casting off his wife of twenty-two years taking their children with him and tearing her family apart. With so much going on in his private life, it’s difficult to imagine how he managed to be so productive in his professional his life, but he was. With nineteen and a half novels under his belt, not to mention his other literary endeavours, Dickens was a power house of creativity. Carefully reading through his letters, diaries and the accounts of his friends, Tomalin traces through the people, places and events in Dickens’ own life which inspired him to write his best-loved works. The woman who jilted him and inspired the frivolous Dora, his experiences as a child labourer which allowed him to empathise with the lost children of London and the secret tragedy which one particular summer caused him to dwell on the fate of illegitimate children. Whether you love Dickens’ books or hate them, you can’t help but appreciate the unflinchingly balanced portrait that Claire Tomalin has written with warmth, humour and humanity worthy which are worthy of the great man himself. 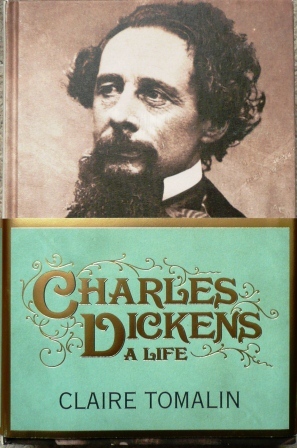 This entry was posted in Book Reviews and tagged books, Charles Dickens on February 6, 2012 by Siobhan. I came across this brilliant cartoon on facebook earlier which gave me a real giggle. It’s from a website called Girls With Slingshots. There are lots of funny cartoons and she has Etsy shops full of cool stuff. This entry was posted in Fun Stuff and tagged entertaining, writing on February 2, 2012 by Siobhan. Anyone after a little midweek word fun should visit Visuwords a great website which allows you to look words up and presents the definitions and word relations to you in a visually accessible manner. I like it because it’s pretty and cool. 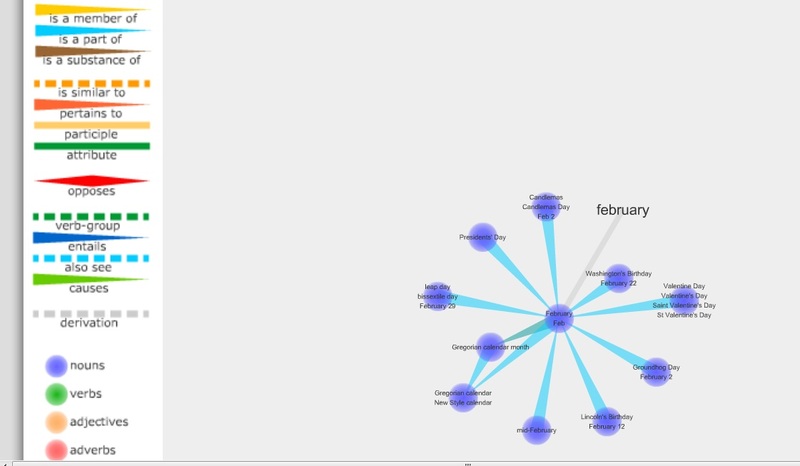 I’ve included this zoomed in screen shot of February to reward you for surviving January, but my favourite Visuwords so far are cheese (looks like dandelion), harbinger (looks like a slug) and book (obviously, but it bursts into life and looks like a half melted snowflake). What Visuwords have you discovered? This entry was posted in Fun Stuff and tagged books, entertainment, words, writing on February 1, 2012 by Siobhan.